Papers, Please ($7.99) is a weird game, as it’s incredibly difficult to succinctly describe in a way that makes it sound even vaguely fun. Developer Lucas Pope (Of Helsing’s Fire ($0.99) fame!) manages to turn pedantry and tedium into gameplay elements and in the process crafts an experience that will likely be among the most memorable games you’ve played this year. It’s been out on the PC for about a year now, but much like FTL ($9.99), it always felt like Papers, Please truly belonged on the iPad. Set in the fictitious dystopian Eastern Bloc-ish country of Arstotzka, players assume the role of a newly assigned border control officer. 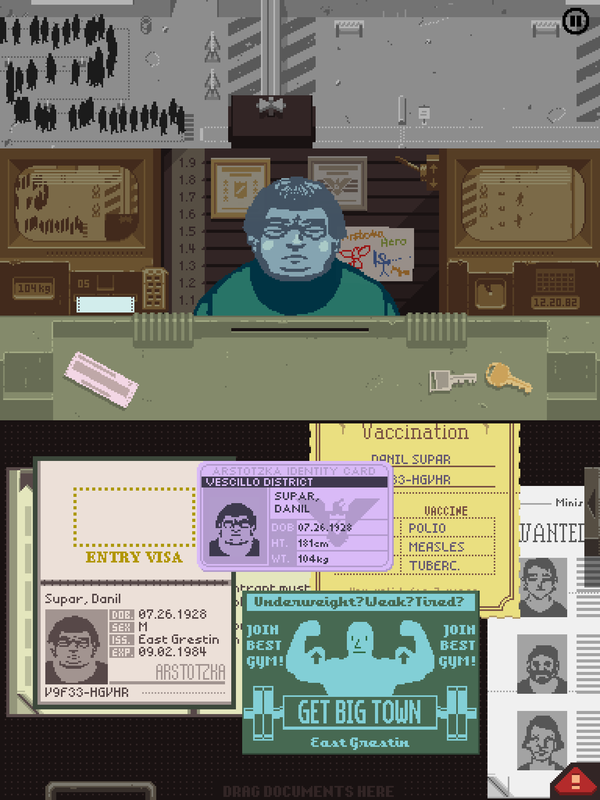 The basic gameplay loop involves tapping the speaker on the top of your post to summon the next potential immigrant, asking them, “Papers, Please," and then inspecting their documentation. This involves flipping through in-game reference materials and tools to make sure issuing cities of passports are correct, document seals are in order, and everything matches across the various forms and identification you’re given. As the game progresses, additional documents (and security screenings) are added to the protocol you and entrants must follow, which quickly amps up the complexity of allowing or denying entry. 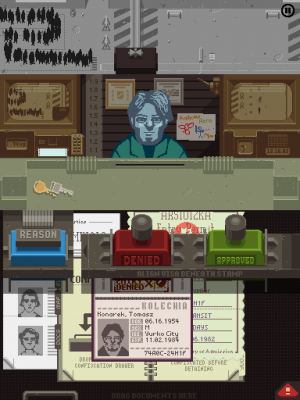 Papers, Please has been labeled an “empathy game," and it’s really hard to come up with a better way to describe it. Despite being the main gameplay element, the act of checking everyone’s paperwork quickly becomes secondary to other events that transpire. I’m incredibly reluctant to offer any specifics, as discovering these things is a large part of the experience, but let’s just say… Not everything is as easy as black and white in Arstotzka. You will be put in many situations where you’re forced to decide when rules should be broken, often leading to consequences for you and your family. The problem with bending the rules is every error you make (intentional or not) results in an infraction from the Arstotzkian government. Each day you get two infractions without penalty, but any after that will set you back five in-game dollars. Working as a state official in a pseudo-communist country doesn’t pay well. You’ll often struggle just to feed and house your family, and when anyone gets sick, that’s where you’re put in the position of making difficult decisions. Someone approaches the border without proper paperwork and a story that pulls at your heartstrings, potentially revolving around love or loss- Do you let them through, potentially at the personal cost of not being able to afford medicine for your son? I’m trying hard to tap dance around specifics, as the events the game throws at you are really best experienced without knowing they’re coming. Some are upsetting to the point that you’ll reload your game save over and over just to see if there’s any chance you can make different decisions to prevent it. Others are hilarious, such as your multiple encounters with the recurring character Jorji Costava which the game doesn’t waste any time introducing you to. What’s so strange about Papers, Please is I’m not even sure I’d describe the game as fun. As mentioned, the core gameplay loop involves a intentionally repetitive and mundane task. The setting is incredibly depressing at times, particularly as the game succeeds in storytelling so well that it actually can be stressful to play. Again, without spoiling anything, we’ll use the sick children example: Money is tight in Arstotzka, and not being able to pay your rent brings your life to an end. Sometimes things are so tight that you need to perform an entire day’s work flawlessly, which actually really stressed me out, as one tiny mistake can quite literally mean the death of your sick and hungry son back home. I think that’s what I love so much about Papers, Please. There are few games on the App Store that can invoke this level of emotional connection. You will genuinely feel bad for people who need to get into your country but can’t. You’ll be forced to decide if you want to detain these people for minor infractions (resulting in a monetary kickback from your guard friend, which your family may need) or just send them on their way. It’s these things that make Papers, Please something you simply must experience- And it helps that the iPad feels like the definitive way to play it. 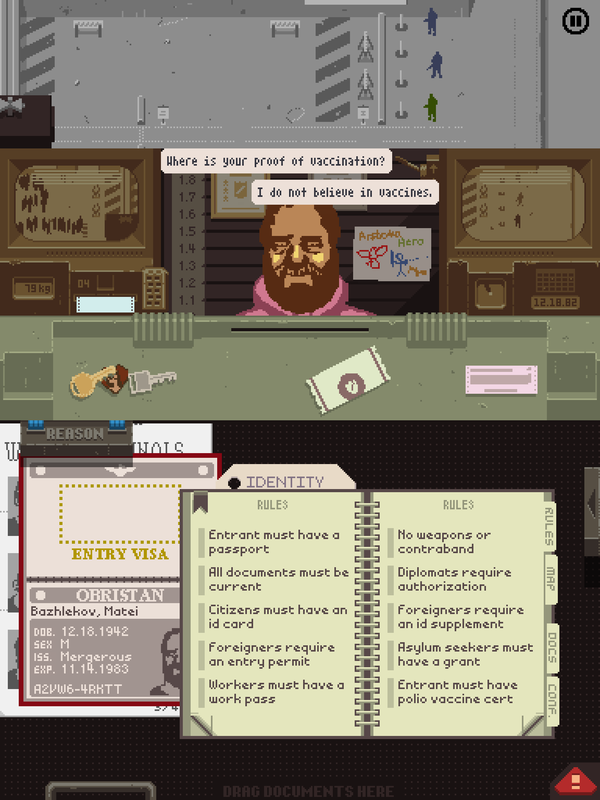 Doing your job in Papers, Please (obviously) involves shuffling around lots of paperwork. It worked fine on the PC, but as mentioned before, it always felt like a mouse cursor was the wrong way to control the game. It’s much better, and far more intuitive with touch controls, particularly as you unlock the multitouch ability for 10 in-game bucks- if you can afford it. The pixel art is crisp, and all the music and sound from the PC version has carried over flawlessly. Really my only complaint with the game, and this is very minor, is that it feels vaguely misleading to boast that it has 20 endings. While technically true, it’s more accurate to say that there’s a “good" ending, an “ok" ending, a “bad" ending, and 17 different game over conditions. For instance, running out of money and getting put in jail because you can’t pay for your apartment counts as an “ending." It reminds me of old school Choose Your Own Adventure novels and counting the whole “Turn to page 196, you’re killed by a boulder" as an “ending." Technically true, sure, but it’s not what you’re looking for. Regardless, seeing all the different endings is pretty easy thanks to a shockingly great game save manager. You’re able to load any day, and taking different actions on that day splits following days into their own timeline which you can do the same with. It’s really neat, because as long as you remember a specific event happened on a specific day, and you want to go a few days forward to see how it plays out before ultimately going back, you can. This is one of those things that the game totally didn’t need, and no one would ever have even said anything if it just had three save slots or something, but just makes it that much better. Oh, and if you’re really into checking paperwork, the game has an unlockable endless mode. You need to fully beat the game to get the code you need to input (or you can just look it up on Google). Once inside, you can play three different modes: Timed (10 minutes to process as many people as you can): Perfection (Game ends at first mistake), and Endurance (Game ends when you can no longer pay your bills). 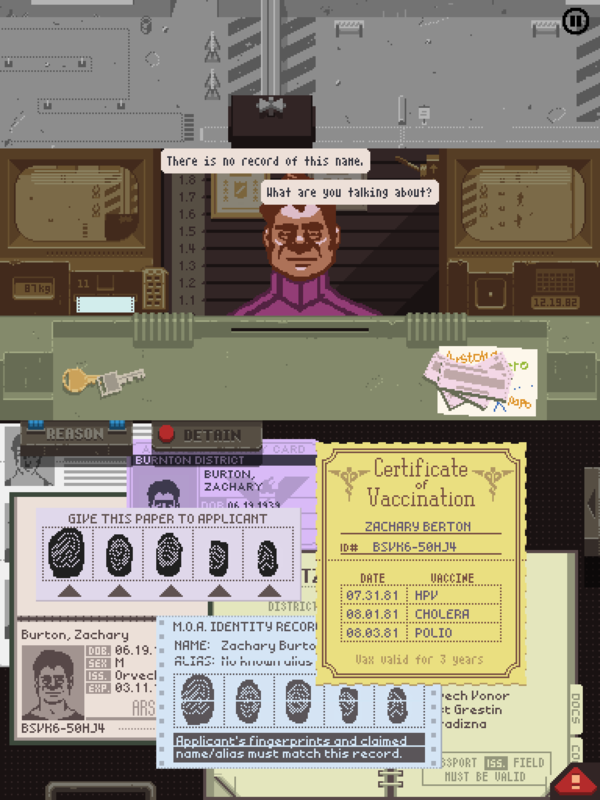 Additionally, there’s four different options for which documents and security features the game throws at you ranging from the minimal tasks towards the beginning of the game to the full enchilada at the end.